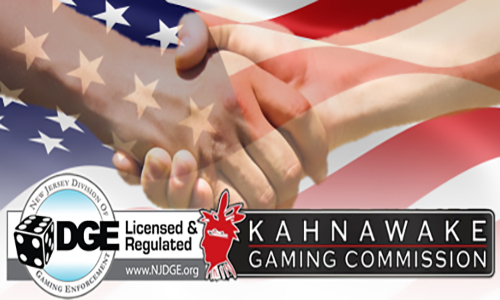 The New Jersey Division of Gaming Enforcement [DGE] today announced an agreement with Continent 8, LLC, the data center offering connectivity to hundreds of online gambling sites that’s based out of the Mohawk Territory of Kahnawake, the tribal reserve outside of Montreal, Canada. The crux of the agreement is the forced removal of sites operating through Continent 8 that are offering illicit gray-market or black-market sports betting and online-gambling services to residents of New Jersey and other US states. Continent 8 operates in close affiliation with the Kahnawake’s private regulatory reserve, the Kahnawake Gaming Commission. The vast majority (if not all) sites operated through Continent 8 also carry the official seal of KGC regulatory oversight. However, the issue of Kahnawake-based sites offering services to residents of the US has been an issue of contention for many years. Canada’s federal government has long asserted that the entire Kahnawake operation is illegal, but to date has not chosen to take any action against the tribal nation. As in the US, tribal reservations operate as semi-autonomous jurisdictions. The Kahnawake’s have long asserted that their “aboriginal rights” extend to online gambling, and have hinted at armed resistance if threatened by any Canadian federal crackdown. When DGE became aware that Continent 8, LLC, may have provided services to certain illegal Internet gaming websites through that data center, it took prompt action. After extensive discussions with the Mohawk Council of Kahnawake and the Kahnawake Gaming Commission (KGC) involving unique jurisdictional issues, the Division was able to ensure that any such websites originating from Kahnawake will no longer be available to United States residents in jurisdictions where these companies are not authorized to operate, after September 30, 2016. As a result, sites such as Bovada, a leading provider of illegal online sports wagering and other online gaming content, will no longer be operating out of the data center located in Kahnawake. Also after that date, the KGC will take regulatory action against any of its applicants or licensees found to be accepting such wagers. But wait. Didn’t Bovada voluntarily stop offering its services to New Jersey residents more than two years ago? That’s one of the curiosities here: This deal and DGE announcement specifically references Bovada, but Bovada isn’t servicing New Jersey anyway. Instead, the DGE seems to be forcing the Kahnawakes’ hand regarding the rest of the US, which is an extra-jurisdictional, “long arm” procedure… noting that that’s typically how US authorities conduct their international business. And of course, Bovada Poker won’t even be Bovada Poker as of October 1st, which just happens to be the exact same day that this deal takes effect. About seven weeks ago, Bovada announced the “sale” (scare quotes used because it’s not quite clear what’s going on there) of its US-facing poker operations to Ignition Casino. Two things weren’t clear about that sale announcement, not even speculating as to the why of it all. First, it’s fuzzy as to exactly who’s behind the Ignition Casino operation, or where it’s housed and operated, business names and the like notwithstanding. Second, Bovada itself was created as a US-facing offshoot of the Bodog brand, and both Bovada as of right now and the Ignition Casino site both use skin-branded Bodog software, regardless of where they’re housed or operated. So all this appears to be a US on the hunt for Bodog thing, through various and sundry intermediate layers. (One cute aside to all this: Bodog founder Calvin Ayre no longer appears on the US Immigration and Customs Enforcement [ICE] list of its ten most wanted fugitives. A nattily-dressed Ayre once appeared there for several years, amid a collection of drug-traffickers and murderers, in an enduring moment of US authority-based high comedy. The more important takeaway: There’s been some enforcement movement behind the scenes, and the reasons for that Bovada move to Ignition Casino last month now seem more clear.